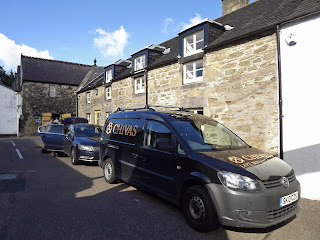 My first day in Scotland was a very long one, especially since I had traveled nearly 24 hours to get to Linn House, the property owned by Chivas Regal. I was more than ready for my first meal and the lunch was a glimpse into the gourmet dining to come. The table was beautifully set for lunch. I sipped the just released 2011 Brancott Estate Pinot Gris (delicious). It reinforced my desire to fit in a trip to New Zealand sometime soon. The pork loin with turnips and potatoes was prepared perfectly and we finished up the meal with a plate of cheese, fruit and crackers. Colin Scott, Master Blender at Chivas Regal, escorted me, along with Lauren Nodzak of Pernod Ricard, and Mahesh and Nina Patel (more about them to come), across a bridge and beyond the waterfall to Strathisla Distillery, where they make Chivas and Royal Salute scotch whiskey. 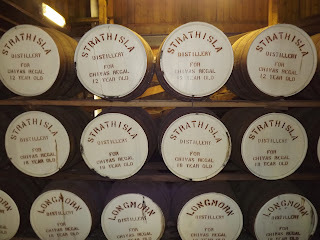 Strathisla Distillery dates back to 1876 and is the oldest distillery in Scotland. 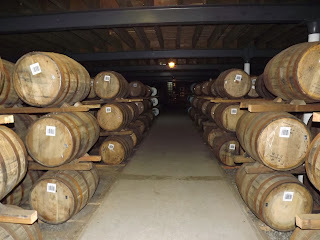 They use malted barley here, using a slightly different type for each whiskey. 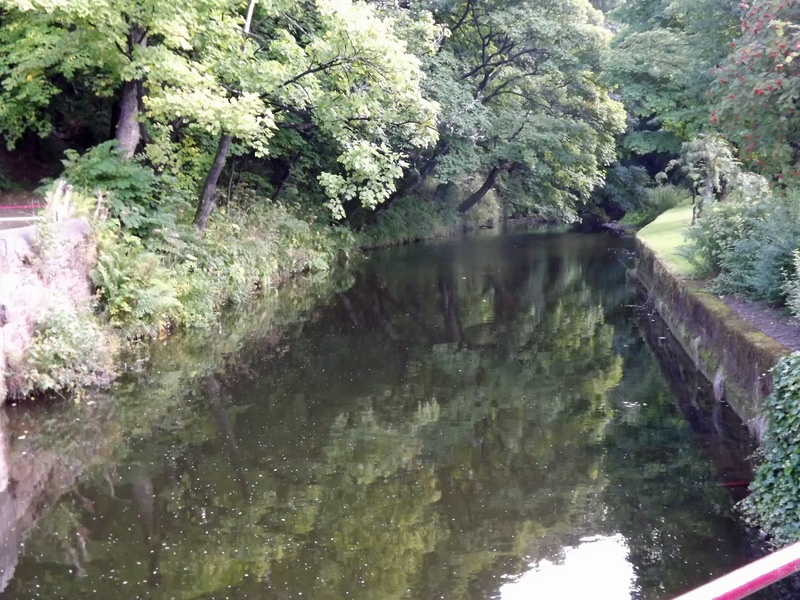 The water comes from Broome Hill Springs, just four miles away. 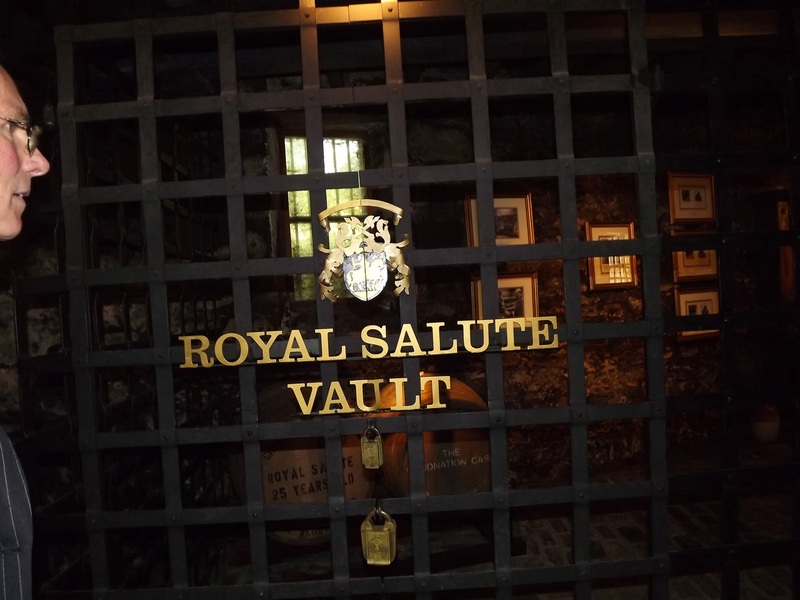 We walked through the production room before going into the barrel room and through to the Royal Salute vault, where the very best scotch in the distillery is kept. The first Royal Salute Scotch Whiskey was created for the celebration of the Queen’s coronation in 2003 by Scott. It was aged again once he blended it. There were 255 bottles of Royal Salute 38 and they started at a selling price of $10,000. The last one was purchased in 2009 for $35,000. We were able to taste some, with its rich vanilla/caramel notes, as well as a bit of gingerbread. It had certainly picked up a lot of flavors during 10 years. 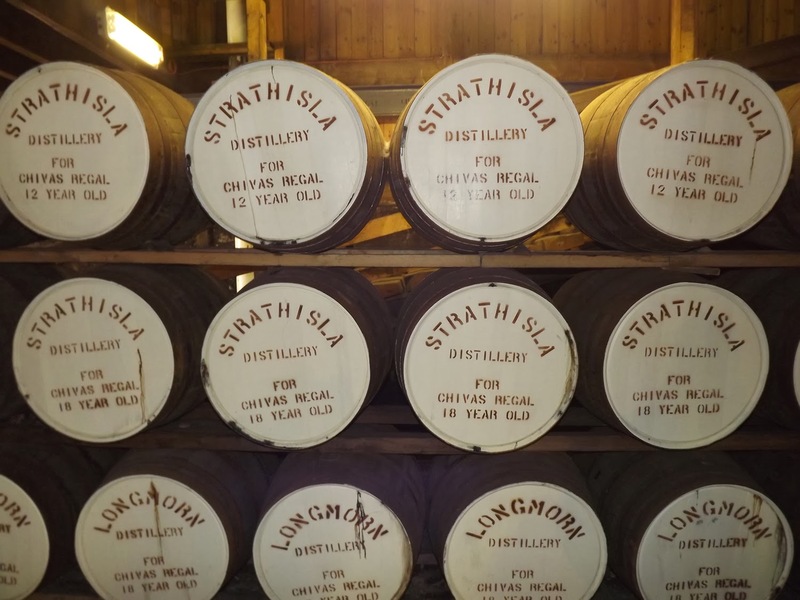 Before we left the distillery we tasted quite a few of their other whiskies, including their 25 year old Strathisla, with a bit of a nutty taste; 21 year old Chivas, with sweet floral notes; and Royal Salute 21, made for the Queen’s birthday with a bit of apricot tones in a smooth blend. 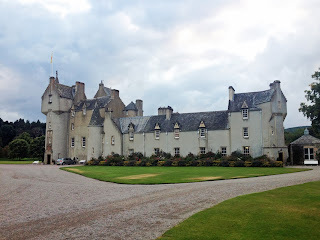 After the distillery tour we headed to Ballindalloch Castle. It was about a 20 minute ride before we arrived at the 25,000 acre estate. 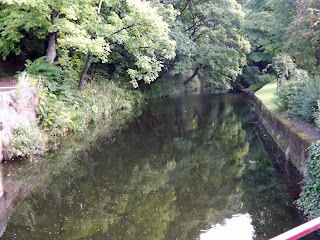 We went past beautiful rolling hills, gardens, cows, and even an area of alpacas and llamas. When we finally arrived into the circular driving, I couldn’t believe how stunning the castle was. Claire Russell, who owns, runs and lives at Ballindalloch along with her husband, greeted us and helped me up through the passageways and staircases to my room. 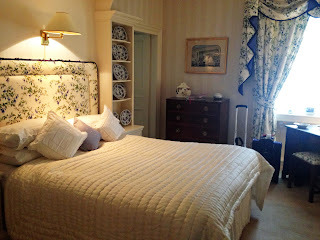 The room was royally decorated with a large bed, vanity and chairs, as well as a big bathroom with an extra-long tub. I didn’t have long to shower and change for our Black Tie dinner. 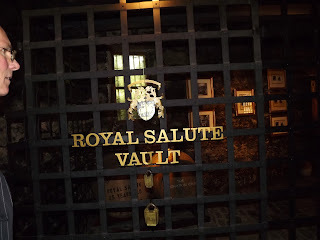 I picked up a glass of Royal Salute downstairs and went out to the lawn for photographs. 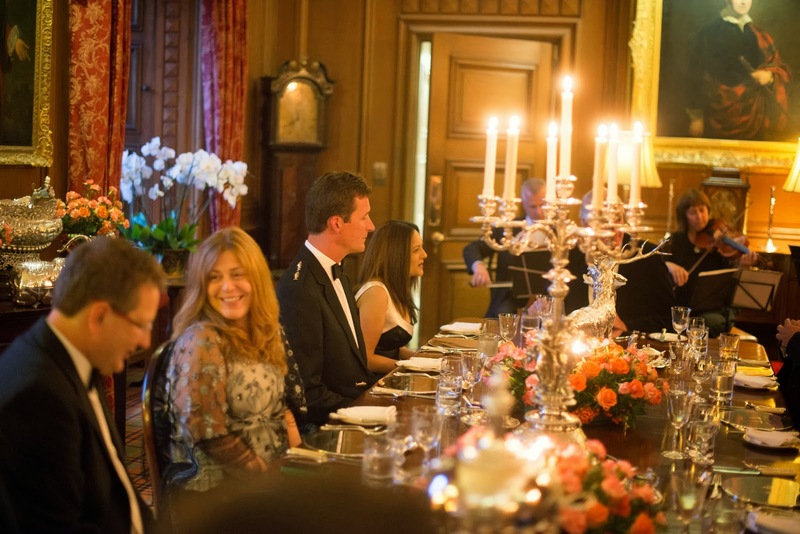 Our dinner was extremely formal in a magnificent dining room that looked like it belonged in a castle! I sat in my assigned seat, next to the Duke of Argyle, along with Lauren, the Russells and the Patels. The first course was a scallop appetizer and since I am allergic I was lucky enough to have to most amazing cheese soufflé I’d ever eaten, with tidbits of pears and broccoli. I was happy to see the Brancott Pinot Gris once again being poured, along with a flight of Royal Salute whiskies. Venison was served as a main dish, accompanied by scalloped potatoes. I’m not much of a venison eater and the site of the (sterling silver) buck in front of my plate confirmed that it was not for me. Instead I ate every morsel of the potatoes and vegetables, and had plenty of room for dessert – ice cream with caramel and banana. After dinner, we had the presentation that I had come for. 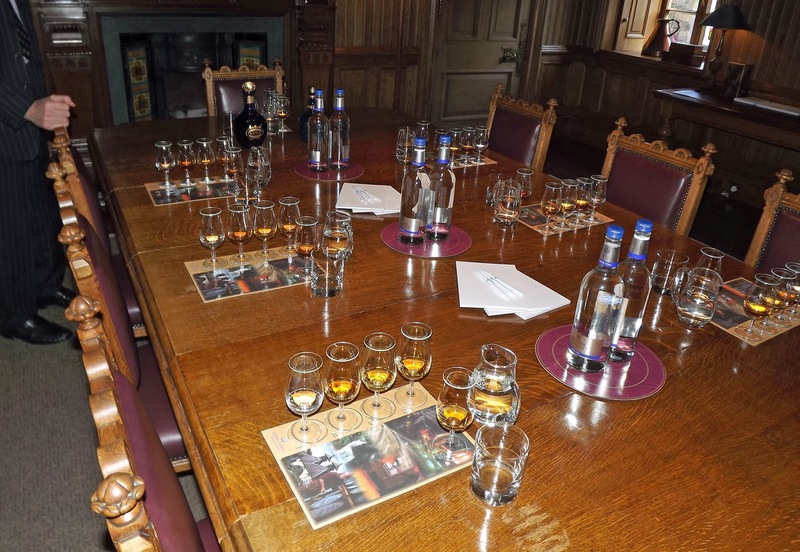 Mahesh Patel, whiskey collector and CEO of Universal Whisky Experience, was to become the first American to buy the Royal Salute Tribute to Honor. Mahesh was presented the bottle (which cost him about $250,000) in a beautiful case, and he and Nina were handed white gloves so they could pick it up without damaging the 413 white and black diamonds on the bottle! I was speechless as I looked at it with the beaming new owners. Everyone stuck around for a few more drinks, but I had been up for about 40 hours when I excused myself to get some sleep before another big day in Scotland. I guess this is a little glimpse of how the other .01% lives. Since one of my former jobs was advocating for the poor as a legal aid attorney, I'm not sure I could have made it through the presentation of the $250,000 bottle of whiskey without saying the "wrong" thing. Did it feel like you had fallen through the Looking Glass? Wow - that's great the experience! What a beautiful castle and meals. You ate venison. Was this hunted on the grounds of the castle? Yes, the venison came from the estate and I couldn't eat it. 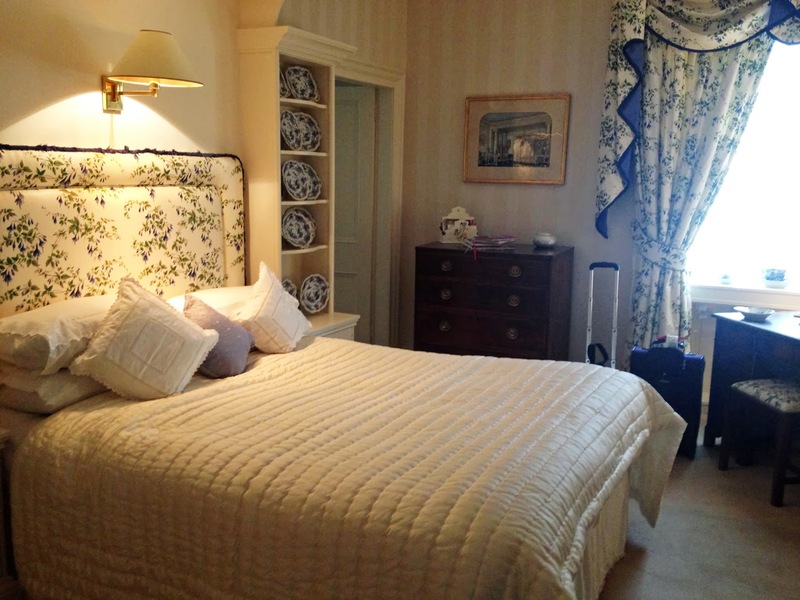 Welcome to View from the Vines Travel!